Cool DIY Costume for a Boy: A Tiki Man Spotted in Upstate New York? My 4 yr-old son was always banging on everything he could get his hands on. We all started calling him Bam-Bam. 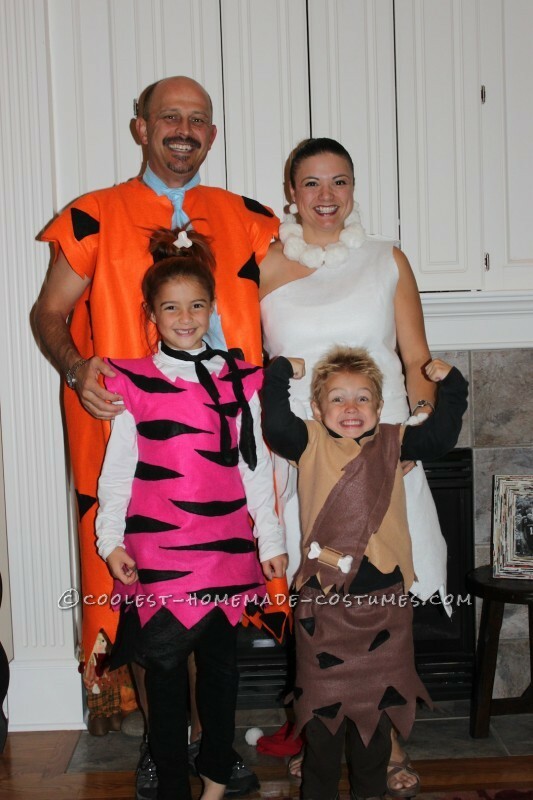 My 9 yr-old daughter decided that’s what he should be for Halloween and that segwayed into the whole family being the Flinstone’s. (She of course had to convince her father who never dressed up and a new family tradition was born! Once he agreed I ran to the fabric store so that he couldn’t back out!). I’m not a seamstress by any means but I’ve never backed away from any challenge! I always have the motto that if someone can do it – then I can too! 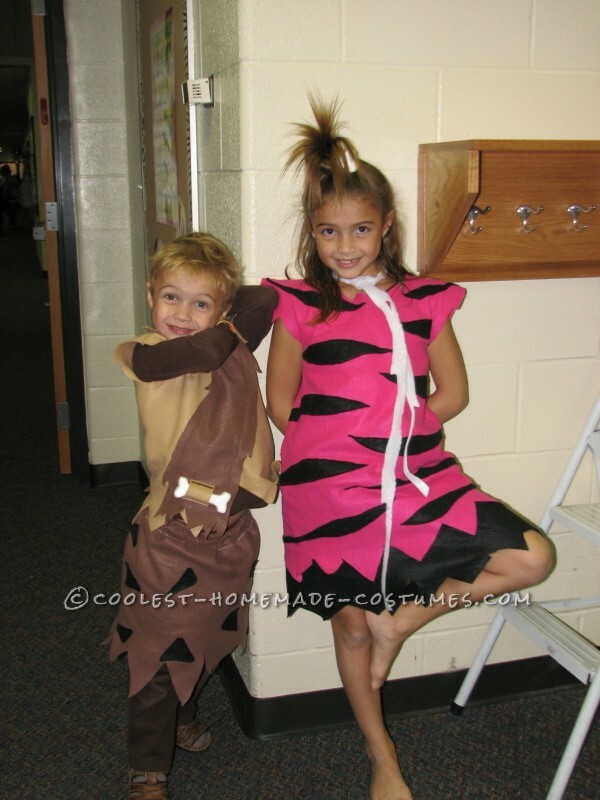 Each costume had it’s own decoration such as big rounded triangles on Fred’s costume or tiger stripes on Pebble’s costume. I used glue on Fred’s since I knew my husband wouldn’t be as rough on the costume and actually sewed the black stripes on Pebble’s hot pink tunic and the black triangles on Bam-Bam’s skirt. I found a Styrofoam bone at a craft store and put one in Pebble’s hair and a piece of white (or black – she had two and wore both to different events) felt for the sash/scarf tied around her neck. A black felt skirt with an easy elastic waistband completed her ensemble. Bam-Bam’s tunic was a bit more involved. 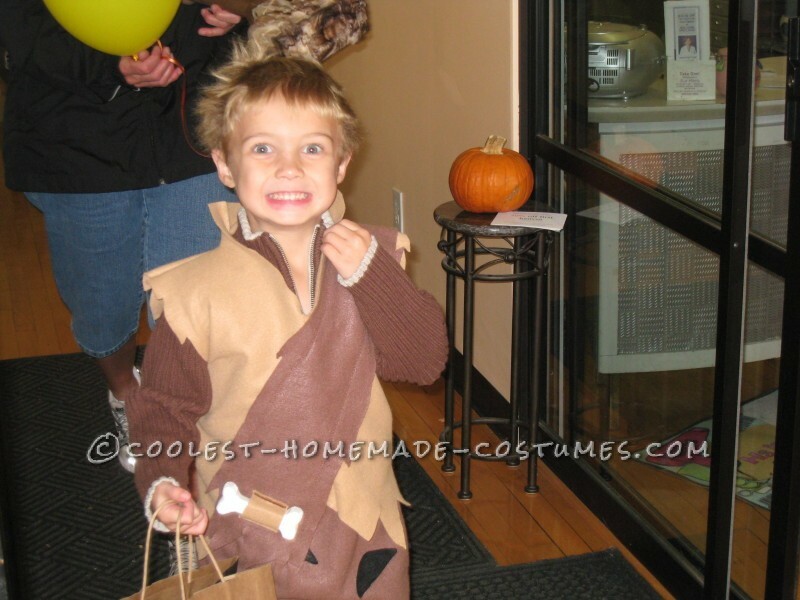 I had two colors of brown and used the lighter color to make the tunic/shirt and the darker color made a sash which I sewed across the front and back finished off with another Styrofoam bone like it was what held the sash in place. We found a foam warriors club/axe at the Renaissance Festival because Bam-Bam needed to have something to Bam! without damaging the world around him (which he very quickly had taken away from him after Halloween because he couldn’t resist hitting things he shouldn’t!). My Wilma costume was probably the most difficult since I was working with a one shoulder design and around boobage (sorry can’t think of a better way to put it!). It was not the best fitting frock I’ve ever worn but I put a strappy white tank underneath and just tucked the shoulderless sides strap under my arm. I also made a white belt with scrap felt to help add some shape to my unshapely costume (once again – a seamstress I am not!). I used large white pom-poms to make Wilma’s necklace and small pom-poms for earrings strung on clear thread and tied to some old jewelry. On the actual night of Halloween it was COLD so I made the kids put pants and long sleeves under their costumes but luckily we had the right colors so that it kind of matched. Everyone loved our costumes! We were a hit! My husband told everyone that he was slightly older than when he was in the cartoon and since then he’d lost his hair. It was a riot! My son of course loved getting to beat on everything around him with the foam war hammer and didn’t hesitate to bonk kids in his way on the head if they slowed his trick-or-treating progress. We loved the family theme so much that we did Scooby Doo the next year and I even dressed my Honda Pilot up as “The Mystery Machine” for our town’s Trunk or Treat event! Those weren’t homemade costumes so I won’t be submitting those but it sure was fun! The next year we did The Jetson’s and we were able to celebrate Halloween at Disney World! I’m attempting to pull together Peter Pan, Tinkerbell, Captain Hook and one of the Lost boys for Halloween this year but my daughter is now in middle school and is not on board with the family theme idea. And if she won’t do it then my husband is out too. Boooooo! So there may just be Peter Pan and Tinkerbell this year but my son is all in and so am I. Besides how else can I pull off being Tinkerbell as a mom and get away with it?